It has been an interesting year in politics! I started writing this on the day that Jeremy Corbyn was re-elected leader of the British Labour Party. Perceived as an anti-“establishment” figure he has challenged the political orthodoxy of his party by mobilising grass roots support to sideline the majority of his Labour MPs . It leaves the party ideologically divided and fragmented, especially at the parliamentary level. By contrast Corbyn, and the Momentum movement that has given him almost cult-like support, have grown in political power, although some believe it will make his party unelectable . Momentum is one of many growing radical political groups in Western Europe, in this case of the left. Before this there was the UK’s decision to leave the European Union, the so-called Brexit. The referendum, put before the people by former Prime Minister David Cameron, was intended to settle the matter of the country’s relationship with Europe once and for all, by the people voting remain, as Cameron had campaigned. Instead they voted by a narrow majority to leave, seen by commentators as a blow against the “establishment” . In practice what it has done is highlight the magnitude of the divisions that exist in the UK over this issue, and the related issues of migration and economics. Nigel Farage, the father of Brexit, inspires devotional loyalty from supporters, very much like Jeremy Corbyn does from his. Unlike Corbyn, Farage’s party has only one seat in the British parliament; relying on their seats in the European parliament they dislike so much for their legitimacy! Then there is Donald Trump, perhaps the ultimate anti-“establishment” figure. Having seized the Republican nomination with what many see as outrageous promises and attitudes, he is now gaining ground in the race for the White House. If mathematician Serge Galam is correct then Trump has a winning formula that could see him as the next president of the USA . One thing is certain, whoever wins it will leave the USA more ideologically divided rather than united. Trump, Corbyn and the Brexit leaders have two things in common. Firstly they thrive on support from people who dislike the “establishment”; people who have a deep distrust of the politicians who run their countries and parties. Secondly they create more division. For them success does not come from broad consensus across people with a wide range of conflicting opinions. It is sufficient to get a majority, however narrow, as a mandate to “dictate” on behalf of the enlightened people who voted for them. There is nothing new in these phenomena, there a plenty of examples in history. My interest here is they could be signs of a decline in social cooperation in the West. Now my main interest in modelling is the growth and decline of the Christian church. I prefer the former, but decline does teach valuable lessons. I have written on one model in particularly that explains the transition from growth to decline of denominations in terms of their increasing institutionalism . I have applied it to both the Wesleyan and Welsh Methodists, showing that they fit a lifecycle of dramatic rise followed by a slow decline . A side-effect of the rise in institutionalism has been a disconnect between the denominational leaders and a significant minority of those they lead. The current state of the Church of England and the Church of Scotland are examples. Like the Brexit, Corbyn and Trump phenomena there is increasing division and fragmentation in church denominations. What intrigues me is the parallel between the decline in the historic Christian denominations, and the decline in confidence in establishment Western politics. Perhaps they are examples of a wider fragmentation principle. History is full of examples of empires that rose, flourished and collapsed. Rome is the obvious example, documented in the well-known book by Gibbon . A historian, Peter Turchin, has attempted to explain this imperial lifecycle using mathematical models . He does it with two variables of interest: the size of the empire, perhaps measured by its dimensions or population, and the capacity of its population for concerted collective action. This second variable Turchin calls “Asabiya”. For a group of people to have high asabiya there must be a high degree of cooperation among people of diverse views. This often occurs because a cause that on which they agree is far more import than the ones over which they disagree. Turchin argues that new empires are formed in and around the periphery regions of decaying empires, as the rebellious regions are united by the threat of the old empire. Sometimes it is a common religious belief that creates high group asabiya. Empires start and grow through high asabiya. As the empire gets larger, richer and more established it becomes harder to find common ground among its population and among its leaders. With peace and prosperity people have the luxury of choosing to dissent, the leaders become complacent and corrupt, people increasingly distrust their leaders, group asabiya goes down. These dynamics are expressed in figure 1. 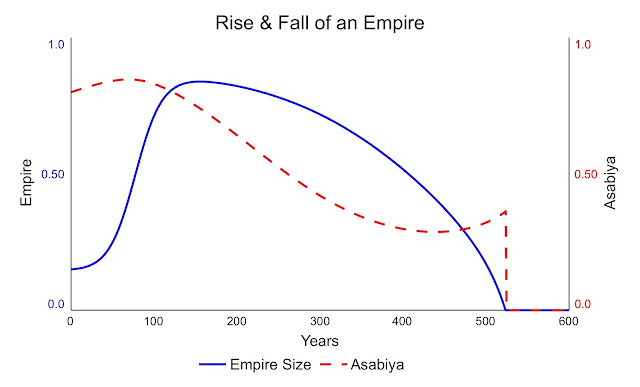 In this particular simulation although asabiya has dropped considerably after 200 years, the empire is still thriving having declined little. 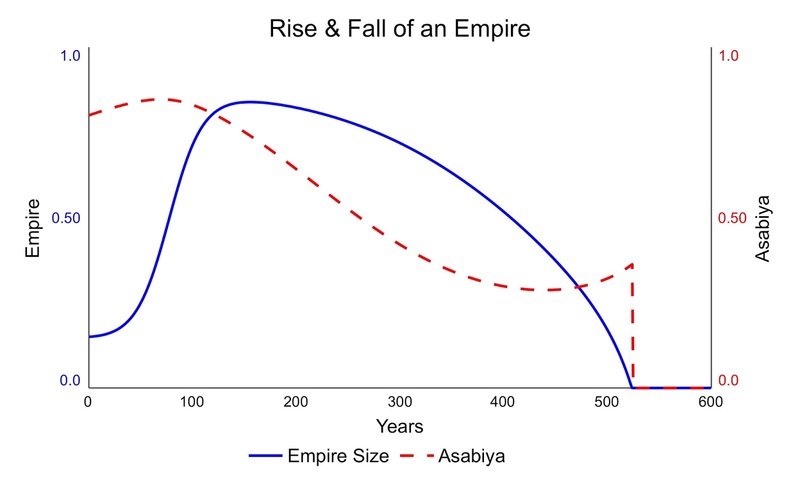 Slowly decreasing asabiya makes the empire harder to defend from outside enemies because it is more difficult for the imperial leaders to obtain the cooperation of its disillusioned people. These people become increasingly fragmented, divided and dare I say, anti-“establishment”. Eventually the empire collapses to its enemies before asabiya has had a chance to recover. New empires emerge, only to undergo the same fate in due course. The Decline of Western Civilisation? The models of Turchin can be applied to the rise and fall of the great imperial powers of Europe. The 20th century saw the collapse of the British Empire, the last and biggest of the European empires, only to be replaced by the emerging American, Russian and Chinese power blocks. However I am proposing that the imperial lifecycle model could also be applied to the decline of Western civilisation. Western civilisation had its rise with enlightenment and renaissance. Free enquiry and trade are good candidates for producing asabiya; causes around which the great and the good could unite. I would further propose that the common religion of Christianity, re-enlightened by the Protestant Reformation, was also a strong creator of asabiya, the one from which all Western nations derive their values. From the late 1800s Christian influence has been in decline, leading to a greater degree of fragmentation of beliefs, values and moral behaviour. It is one of the signs of the declining asabiya of the West, now also manifesting itself in the Brexit, Corbyn and Trump phenomena, among others. The rise and fall of Western Christian denominations is a contributory factor in the rise and fall of the West itself. I am not saying that the movements behind Brexit, Corbyn and Trump are causing the decline in Western civilisation. Instead they are indicators of the loss of widespread social cooperation, society’s asabiya. There are many others including Christianity’s battle to remain in the public space, a battle it has with emerging humanist ideologies . Nor am I saying the people themselves are the cause of the West’s decline. The forces of fragmentation are far more powerful than the individuals involved, who just happen to be in that place at that time. The causes of imperial decline are side effects of the causes of its success; causes which eventually get overstretched to the point they can no longer be maintained. Such causes include prosperity, influence and personal satisfaction. I have not shown the model in this blog. I may do that at another time. To be applied to something as diffuse as a culture the model will need a bit of tweaking. However I hope I have said enough to justify the proposal that civilisation decline is similar to imperial decline in nature and cause – falling asabiya. Also I have proposed that the lack of asabiya, the ability of groups of people, and populations, to cooperate, is manifesting itself in some of the strange political phenomena now being seen. Empires do decline, as do civilisations, but new ones emerge. Likewise churches decline, but new ones emerge. Christianity is very resilient at surviving and thriving through cultural changes. It is one of the ways God builds his kingdom. The word “establishment” is in inverted commas as I realise I have not defined it. Like the word “elite” it is often used without its meaning being clarified. I suspect there is more than one establishment, as there are numerous competing elites. Momentum supporters celebrate Jeremy Corbyn’s victory, The Guardian 24/9/16. The UK referendum on EU membership delivered the result 48.1% remain, 51.9% leave, with a turnout of 72.2%. Generally in the media the EU referendum result is described as an emphatic or large victory for leaving the EU. As this is the whole population who voted, rather than a sample, then there is no statistical error involved in the answer to the referendum question. However I have described the result as narrow as the purpose of a referendum is that a large population is required to deliver a policy intention to a ruling elite. Though there may be no randomness in the answer to the specific question, assuming everyone is sufficiently well -informed, there is a stochastic element in how best the question captures the policy issue at hand. For example the practical ways that the country actually leaves the EU involves a number of options, which the referendum question did not address. Additionally a referendum can have more than two answers. There is no correct way to frame a question, or the number of answers, yet increasing the number of possible answers (and/or questions) can make a big difference to the policy intention delivered. Added to that the nature of the question concerns a quantum change, over a long period of time which is difficult to reverse. It is unclear what winning threshold should be used to make that change in order to reduce the risk of a population changing its mind over say a 5, 10 or 20 year period. This is why constitutional change usually requires at least 60% or two thirds majority to enact change. Thus for these reasons, and others, there is a great deal of randomness in process of a population instructing an elite to make a decision. Thus 51.9% is well in the region of random noise. Thus it is not clear a referendum is a fairer way of making a decision than normal representative democracy. Former Labour Prime Minister Clement Attlee once said: “I could not consent to the introduction into our national life of a device so alien to all our traditions as the referendum, which has only too often been the instrument of Nazism and fascism.” He could have said the same of all “direct” democracy, including the election of party leaders by its membership. The Trump Phenomenon: An Explanation from Sociophysics, Serge Galam, Centre for Political Research, Sciences Po and CNRS, Paris, (2016). The History of the Decline and Fall of the Roman Empire, Edward Gibbon, Classics of World Literature (1998) [1776–89]. War and Peace and War: The Rise and Fall of Empires, Peter Turchin, Plume Books, (2007). Historical Dynamics: Why States Rise and Fall, Peter Turchin, Princeton University Press, (2003).